It's not even September yet but us birders are already in fall migration mode. I told you about the shorebirds that are starting to show up after their brief month of breeding in the arctic. 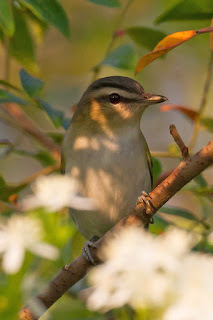 Now, the warblers and other songbirds are starting to show up too. Believe me, it's not like everyone is out birding. There are only a few of us out there (which is nice) but we are being rewarded for our efforts. 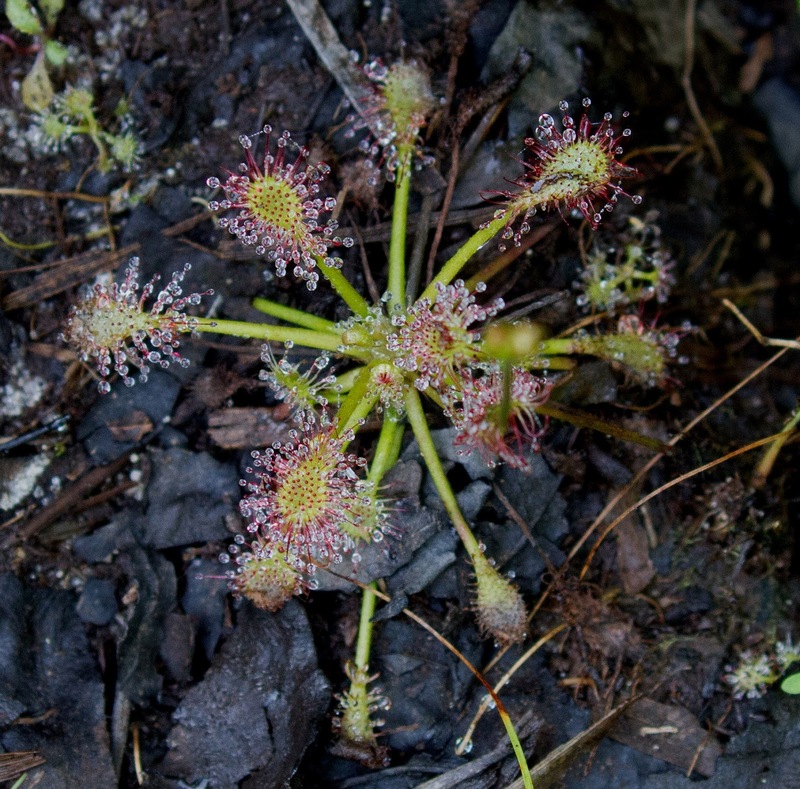 Last weekend was pretty slow but Harvey and I found a plethora of Sundews by the lake at Higbee. I was told that this is the southern-most spot in the US to find these carnivorous plants. The "dew" is actually a sticky substance that traps insects. The plant absorbs nutrients from the dying bug. This one has a dead bug on one of it's sticky leaves (2 o'clock). Barbara and I went to Higbee on Sat and met up with Harvey and George. Vireos were the bird of the day - most Red-eyed with a few other types mixed in. This one posed behind some white flowers for me. 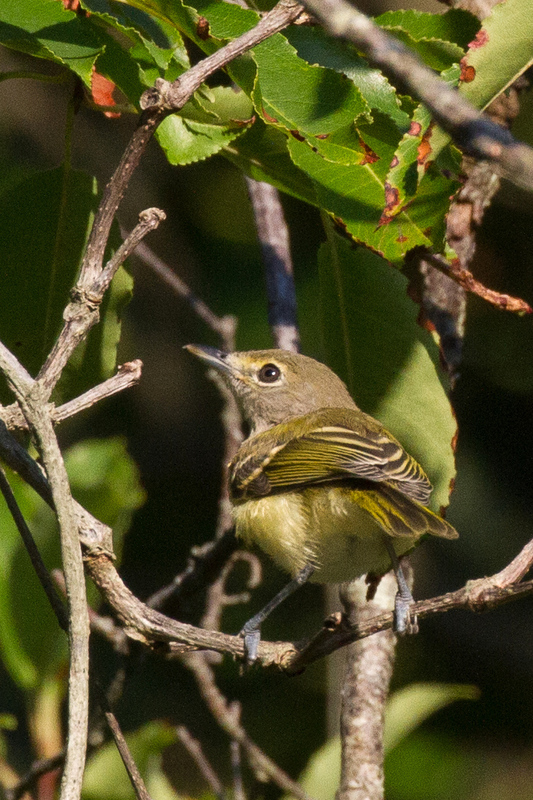 This White-eyed Vireo bounced around in the bushes too. 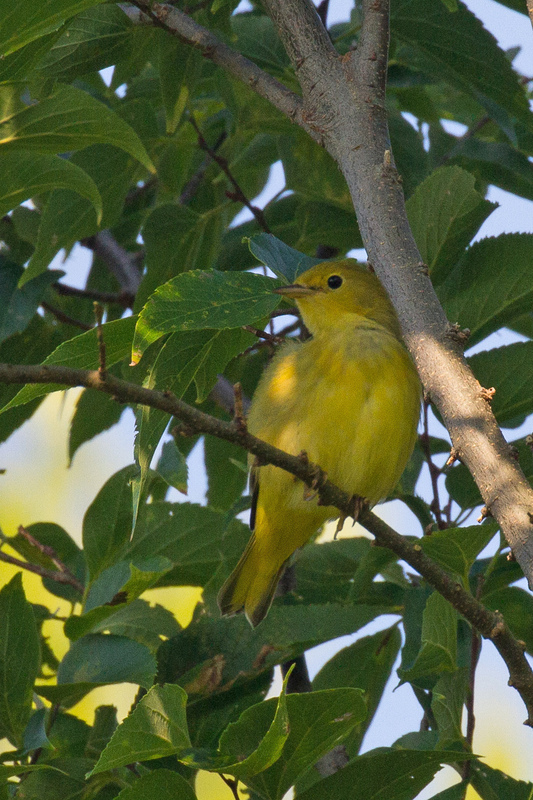 Yellow warblers have a beautifully subtle tone this time of year. Not that bright "hey, mate with me" yellow like in spring. Today, I had the whole Higbee field to myself. Of course, that was because all of the other birders are smarter than me and knew that the winds weren't good for migration. They all went somewhere else or slept in. I wasn't alone by any means. I was accompanied by about a bizillion of my closest mosquito friends. At one point, I literally ran back to the parking lot to try to escape the little blood-suckers. They weren't everywhere. Just in the fields. Peanut and I kept to the wide sand paths for the rest of the morning and had some good luck. 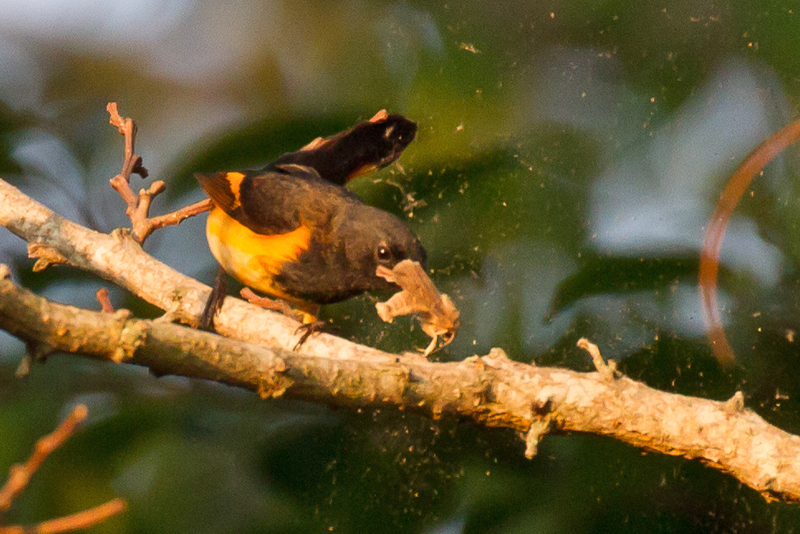 Here is a male Redstart knocking the dust off of a moth before eating it for breakfast. 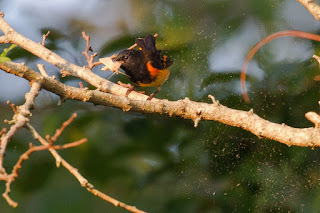 Check out the dust flying. I kind of feel bad for the moth. That poor thing was really beaten to death. Peanut and I walked the beach and the roads. 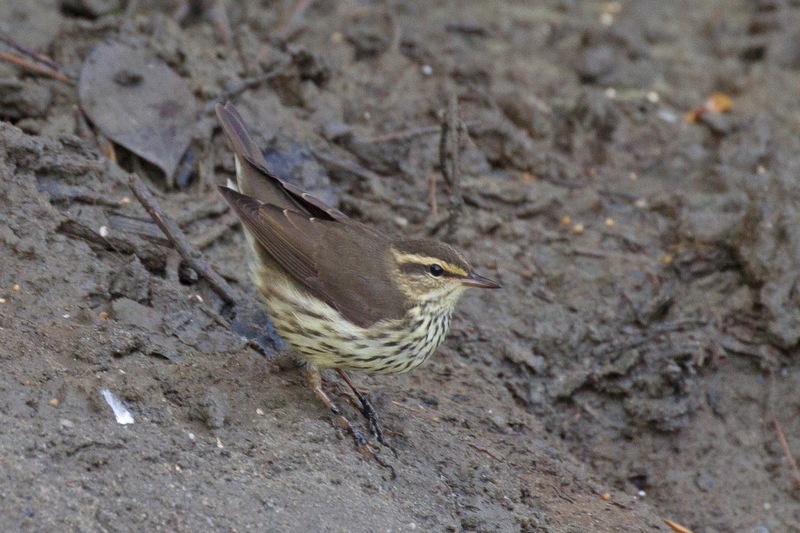 We found this beautiful Northern Waterthrush along the road in a muddy ditch. 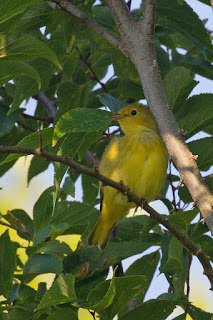 I love the soft yellow tones on this bird. Waterthrushes are tail-bobbers. I caught this one mid-bob as it was walking down the mud pile. 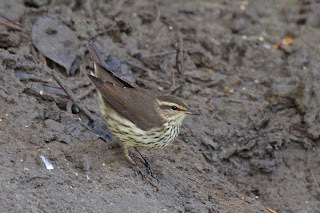 All in all, a nice few days catching early migrants. 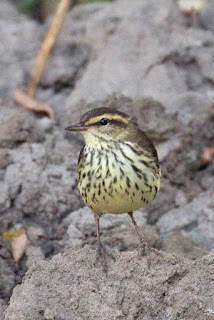 The smarter birders were all chasing after fun shorebirds but I didn't have it me today. I'll get them next time.